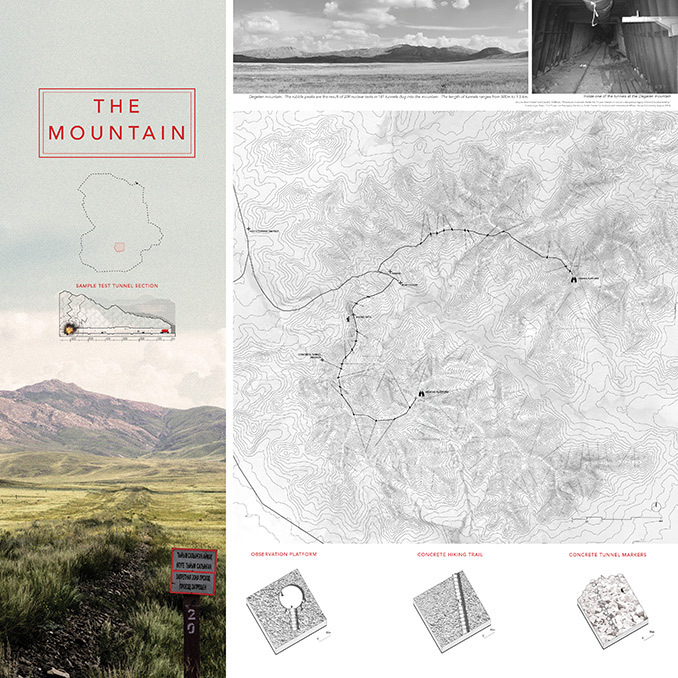 Landscapes affected by nuclear weapons testing are forever present in our collective imagination due to long-term radioactive contamination and fear associated with stigma. Typically, science and technology have driven the remediation of such sites, with often little to no attention paid to long-term management as well as the people affected by the tests living within or near such areas. The Soviet nuclear testing program, in particular, has been one of the best examples of blatant disregard for social and environmental well being, in service of expression of power. 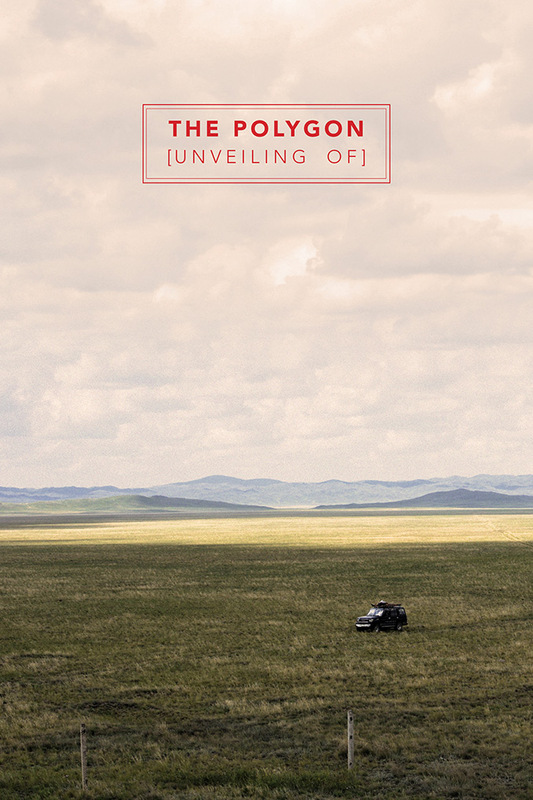 On August 29, 1949, at 7:00am local time, Soviet Union tested its first nuclear bomb in the open steppes of Kazakh Soviet Socialist Republic. 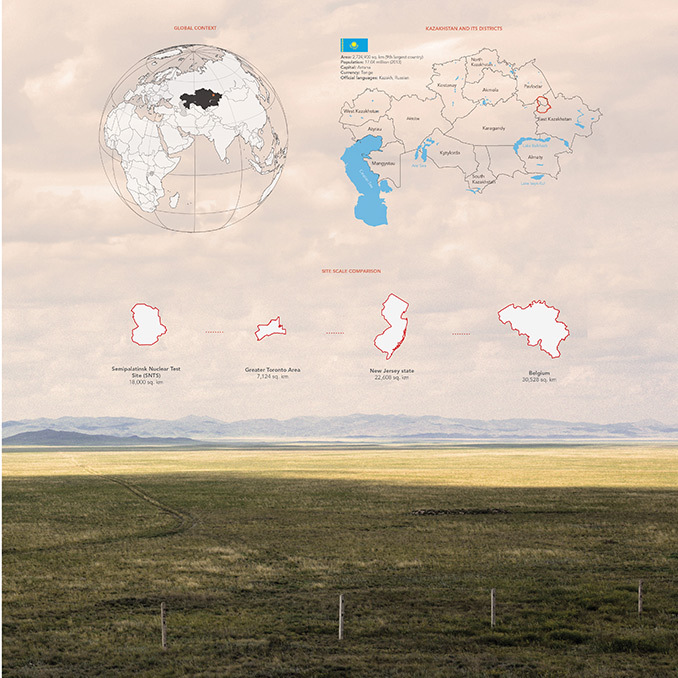 Semipalatinsk Nuclear Test Site was the main location of the Soviet Nuclear Testing Program between 1949 – 1989, home to a total of 456 nuclear explosions. 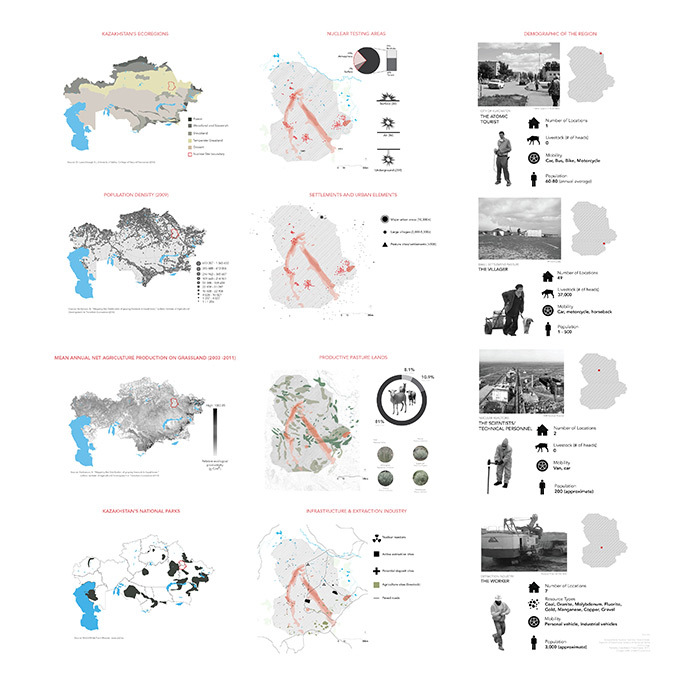 Due to an arms race with the United States, the Soviet Union developed the program swiftly choosing the site based on a quick aerial survey of the area without taking into account thousands of settlers located within the region. In 1991, the site, locally known as the Polygon, was ordered to be closed by the president of the newly independent Kazakhstan. However, due to unstable economy following the collapse of the Soviet Union, personnel involved in managing the site left without proper demilitarization plan, leaving the majority of the military infrastructure intact and open. What followed is years of haphazard and ineffective efforts of regulating activities on site, such as illegal scrap metal scavenging and resource extraction. Due to poor management strategy, the residents still suffer from the stigma associated with the site. The lifestyle of local villagers has been predominantly based on grazing of livestock. Continually searching for new pastures, they are indirectly exposed to low-level radioactivity through consumption of their animals that feed on the irradiated areas. Cancer rates in the area are still 1.5 times higher than the country’s average. The site is currently managed by the Institute of Radiation Safety and Ecology, a subdivision of National Nuclear Centre of Kazakhstan. 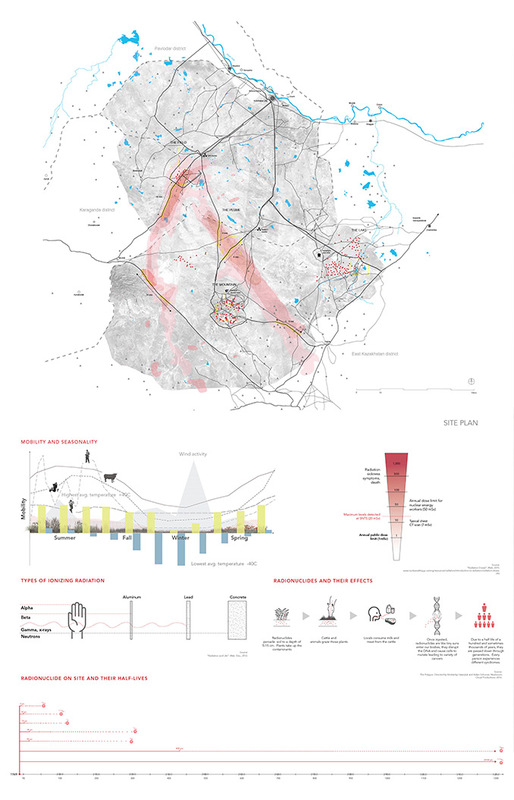 Future remediation and management plans are being devised mostly by scientists, who eventually hope to open up 80% of the site for development. 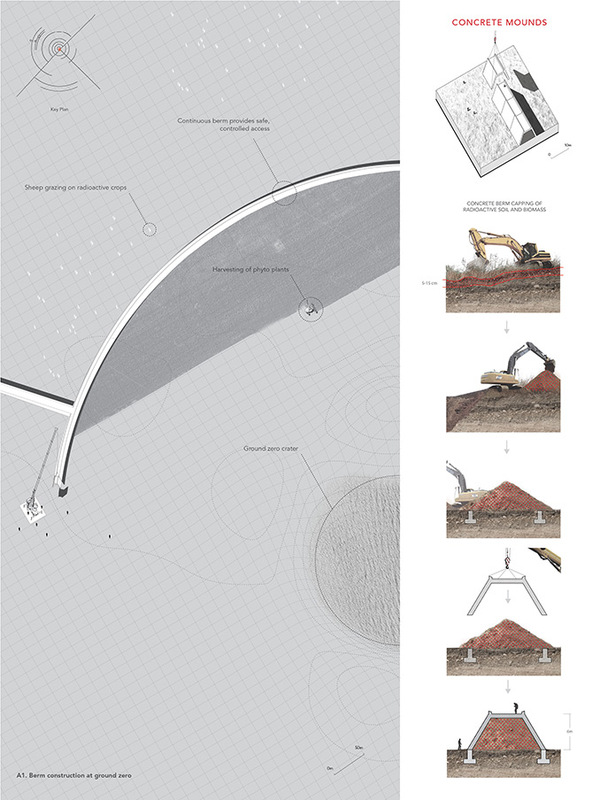 Invisible radioactive contamination, lack of regulations, marginalized communities and permanently altered ecology set up a stage for a new type of landscape identity. 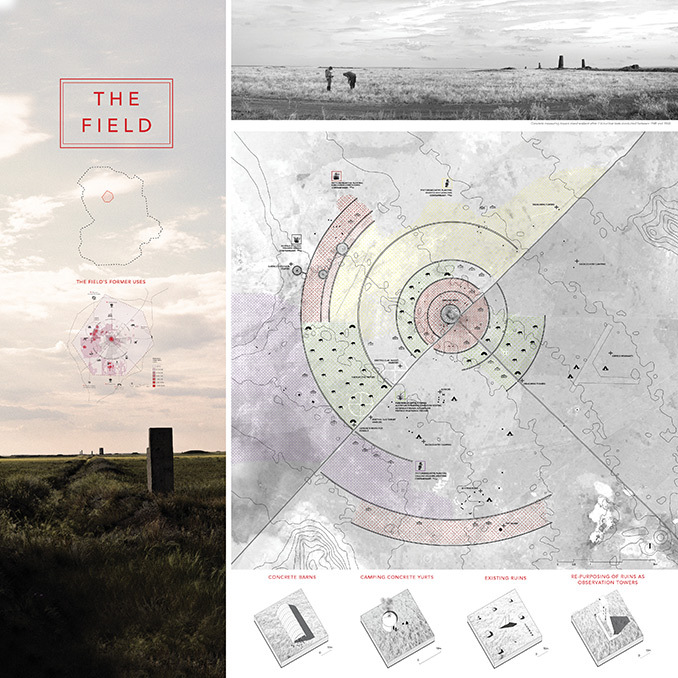 Land art philosophy focused on large-scale interventions and the use of local materials; inspired an idea of landscape markers as infrastructure to be implemented in four key areas of the testing site. 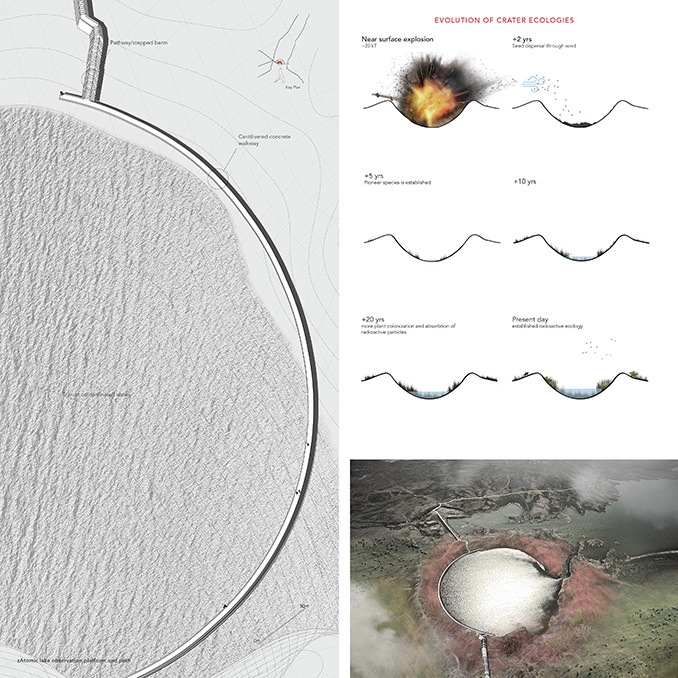 Such strategy acts to make visible the locations and scale of nuclear testing, in turn improving access throughout the site encouraging future land use where it is safe, be it industrial or recreational. 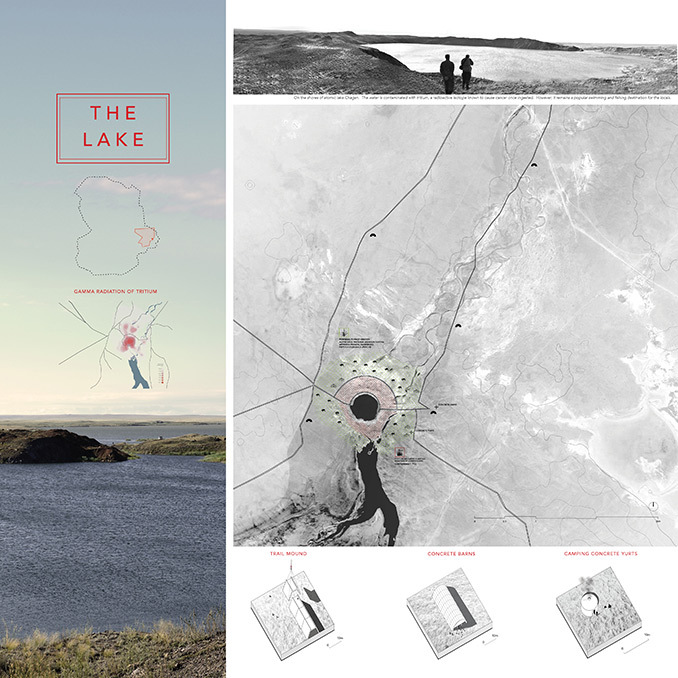 The thesis project focuses on reconnecting the people of the former Semipalatinsk Nuclear Test Site back to the land that has been lost by re-imagining it as a national park. 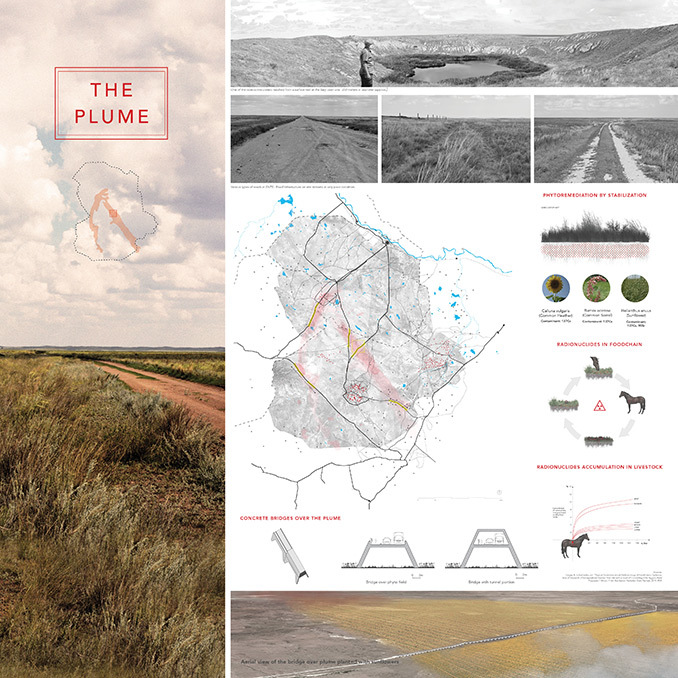 Through the implementation of landscape markers based on a theoretical framework of land art as infrastructure, the landscape is revealed, empowering semi-nomadic lifestyle of people indigenous to the region. Location | Semipalatinsk Nuclear Test Site, Kurchatov City, North Eastern Kazakhstan.